Keep an open heart and a full locket with this fillable pendant made to keep personal tokens close. Keep an open heart and a full locket with this fillable glass pendant made to keep personal tokens close. Wear it traditionally with a special photo or two--its glass panes allow you to show faces on both sides of its translucent frame--or experiment with a collage of mixed photos, materials or small objects. This made-for-life keepsake lets you change up its contents as often as you'd like with inspiring ideas like love notes, quotes, prayers, pebbles, drawings, a lock of hair, sand, sea shells, and more. Magnetic closure. 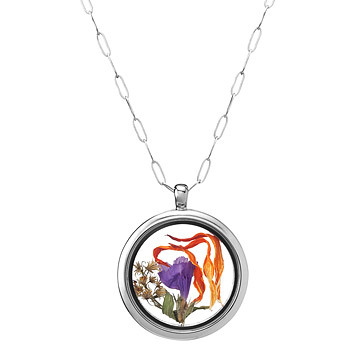 Rhodium-plated mixed metal and glass locket on a sterling silver chain. Chain made in the USA, locket made in China. Hand assembled in the USA. Lockets are sold empty. Photos are for inspiration on how to fill lockets. The locket opens from the the side, with a little flick of your fingernail in the side crease. It is held closed with tiny magnets that are very strong and keep it securely closed. Rhodium-plated mixed metal is primarily composed of brass and nickel. Clever way to keep me next to your heart. Perfect for displaying items that are truly meaningful in a beautifully stylish way. I bought this as a birthday present for my sister who is also getting married shortly after her birthday. I thought this would be a great gift so she could keep some of the memories from the wedding with her. I really love how easy it is to use and i feel pretty confident that she'll love it. I do wish it was a bit longer in the chain, but she may like the length as is. Overall i feel like it's something she'll be able to enjoy for a long time. It's beautiful and just as it is pictured on the website. I love the size of the actual locket and the length of the chain. Honestly, the only hangup I'm having is deciding what to put inside it! And even that's not a big deal because with the magnetic closure on the locket, you can open it and change its contents as often as you like! Love it! Works really well. My mother put a picture in it as a background, a pressed flower along with a charm. I filled this with some memories for a friend who moved away as a birthday gift. Lovely Necklace - Great Gift For Anyone! This was a gift for my mother on her birthday. Inside the locket, I placed a black & white photo of my 2 year old son's face as well as some dried flowers so that it has 2 sides to the locket. She LOVED it! This was a gift for a very good friend. I was able to personalize it with memories we share. The locket opens and closes securely. The chain is delicate so hopefully it will be strong enough to endure. I am happy to give a unique gift to my longtime friend with special memories we share and also know that she can change the things in the locket with other memories she has as time goes on. Bought this for a friend to keep some of her wedding flower petals. The magnetic close is wonderful! Held clips of bride's dress, flowers, etc. Bought two as gifts for our daughters to add little bits of collected momentos from a family vacation to Hawaii. The girls added coral, sea glass, tiny shells, and colorful stones. Loved it so much I bought one for myself! Super unique and have gotten many compliments. The only thing that would make it perfect is an adjustable chain. Would definitely recommend!